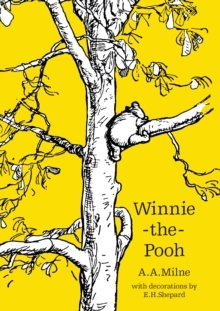 Once upon a time, a very long time ago now, about last Friday, Winnie-the-Pooh lived in a forest all by himself under the name of Sanders'Curl up with a true children's classic by reading A.A. Milne's Winnie-the-Pooh. Winnie-the-Pooh may be a bear of very little brain, but thanks to his friends Piglet, Eeyore and, of course, Christopher Robin, he's never far from an adventure. In this story Pooh gets into a tight place, nearly catches a Woozle and heads off on an `expotition' to the North Pole with the other animals. In this stunning edition of Winnie-the-Pooh, A.A. Milne's world-famous story is once again brought to life by E.H. Shepard's illustrations. Heart-warming and funny, Milne's masterpiece reflects the power of a child's imagination like no other story before or since. Do you own all the classic Pooh titles?Winnie-the-PoohThe House at Pooh CornerWhen We Were Very YoungNow We Are SixAlso look out for Return to the Hundred Acre Wood and The Best Bear in all the World (coming soon)Pooh ranks alongside other beloved character such as Paddington Bear, and Peter Rabbit as an essential part of our literary heritage. Whether you're 5 or 55, Pooh is the bear for all ages. A.A. Milne is quite simply one of the most famous children's authors of all time. He created Winnie-the-Pooh and his friends Piglet, Eeyore, Tigger, Kanga and Roo based on the real nursery toys played with by his son, Christopher Robin. And those characters not only became the stars of his classic children's books, Winnie-the-Pooh and The House at Pooh Corner, and his poetry for children, they have also been adapted for film, TV and the stage. Through his writings for Punch magazine, A.A.